Wheat allergy is one of the most common food allergies in children. The good news is, kids who develop this allergy at a young age can often outgrow it. A reaction to wheat can be anything from eczema (skin) to abdominal pain and vomiting (gastrointestinal) to hives and even anaphylaxis. An allergy to wheat is different than a wheat intolerance or Celiac disease. Celiac disease is an autoimmune disorder in which the small intestine reacts to the ingestion of gluten, a protein that is mostly found in wheat, barley, rye and sometimes oats. 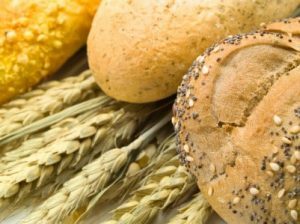 People with an allergy to wheat do not necessarily have to avoid gluten, like those with Celiac disease. This is because wheat has other proteins that cause an allergic response. The main proteins in wheat that can cause allergic reactions are albumin, globulin, gliadin and gluten. The most common culprits are albumin and globulin. People with a wheat allergy typically can have other grains that contain gluten such as oats, rye and barley. It can be difficult, however, to find barley and rye products that don’t have cross-contact with wheat, therefore, people with a wheat allergy often find it easier to follow a gluten free diet. This is especially the case now that so many gluten free products are available in grocery stores. These days, it seems that everyone is avoiding gluten so, you might wonder, do they all have Celiac disease? Not necessarily. Many people follow a gluten free diet because it is the latest diet trend. When people eliminate gluten, they report feeling better, having more energy and even losing weight. This could very well be due to wheat intolerance as it is possible to be intolerant to wheat without having Celiac disease. However, it could also be due to the fact that following a gluten free diet, at least initially, leads people to eat less processed foods and snack foods that people tend to overeat when on a regular diet. No matter the reason for avoiding wheat, you’ll find resources here to help you do it! All of the recipes in the Allergy Free Recipes index are gluten free (some recipes call for oats so be sure to look for oats that are processed in a dedicated gluten free facility as risk of cross-contact with wheat is high). Wheat is in many food ingredients that you may not think about. Some of the ingredients listed below may or may not be derived from wheat such as “modified food starch” and “natural flavoring”. The Food Allergen Labeling and Consumer Protection Act requires that labels clearly identify ingredients containing or derived from wheat, however, it is not required that gluten be listed. Because the demand for gluten free foods has grown and continues to grow (an August 2012 survey by Packaged Facts found the market reached $4.2 billion in 2012), many companies are proactively labeling foods gluten free. As of 2014, the FDA has rules in place for what can be considered gluten free. Under these rules, foods that are labeled “gluten-free” can’t contain gluten (obvious, right?) But the rules also state that “any avoidable presence of gluten in the food must be less than 20 ppm.” This means that companies also have to consider cross-contact with wheat products which is a good thing! For more information about FALCPA, visit the U.S. FDA Center for Food Safety and Applied Nutrition website. The Hill, http://thehill.com/blogs/regwatch/healthcare/284929-gluten-free-labeling-rules-head-to-white-house, Accessed 3/2013.